This is a unique way to enjoy sweet potatoes, and get an added bonus of fruit as well. This recipe comes from the recipe collection of Ethel Eynard. Jefferson City, MO. 2004. 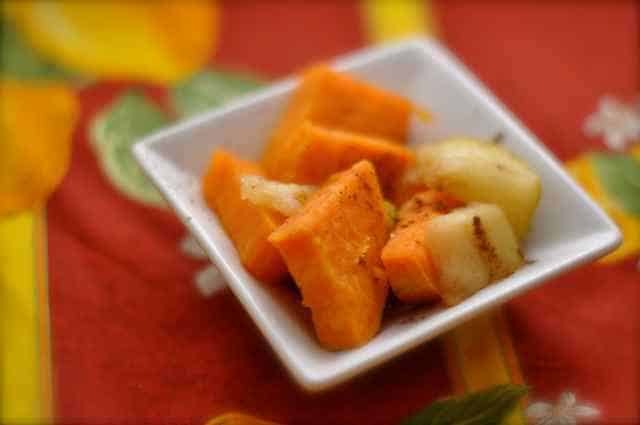 Sweet potatoes and apples taste great together. Spray baking dish with cooking spray. Layer half of each of the sweet potatoes and apples, in an 8 inch square baking dish. Combine sugar, cinnamon, white pepper; sprinkle half of mixture over potatoes and apples. Drizzle with half of margarine. Repeat, procedure with remaining ingredients. Cover casserole and bake at 350 degrees for 1 hour. I usually opt for a savory dish with sweet potatoes. But with only 3 tablespoons of sugar, this looks like a good sweet one to try.